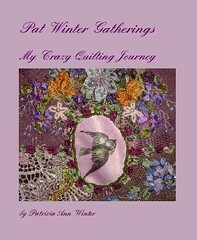 I always enjoy reading Pat Winter's blog and see her beautiful works of art. I had missed reading several of her posts so I decide to catch up on them and I came across this link that she wanted to share. This is a story you really should read on Sharon House's site. It puts the new year in perspective. Sharon, thank you for posting about my give away and for stopping by my blog. Oh yes - The Country Cupboard! Love that store! So much to look at! And yes, the food! Oh my! We love the meatloaf! In fact, we're about due for the 75 mile trip from here to have lunch there one day! Oh dear! You're not Sharon, you're Kathy! I'm so embarrassed! Hi Kathy!!! Thanks for visiting my blog and for the nice comments. Yes, the bulb is a nightlight bulb which came with the unit. I purchased it at JoAnn fabrics, but Hobby Lobby has them as well. It was a fun project and I plan on making some "Shabby" ones for the "new and improved" etsy shop one day.